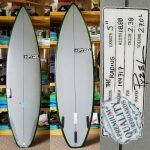 The Gremlin was made to get you excited about surfing on the days that are less-than-epic, and also to give you a taste of Performance that will get you fired up in any kind of surf.The wider outline is complimented by a low entry rocker for easy speed and glide through the weakest, slowest sections, but we keep a bit of curve through the tail rocker to add performance and maneuverability.The bottom runs from single to double concave, with a nice bit of Vee running of the tail. 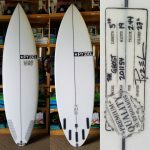 Other = The thickness is pushed forward, which helps even more with getting you into waves easily, and we kept the tail and rails thinned out to help hold through barrels and turns at speed.The rocker is med/low through the front half to get you into waves easily and pick up speed quickly. The rear end has plenty of rocker curve for turning control and a snappy responsiveness. Single concave runs through the entire bottom, with a double concave set inside, which equals speed and lift both on a rail and over flat spots while allowing for quick rail-to-rail transitions. The Ghost’s combination of rocker and concave makes for high performance handling through a healthy mix of sensitivity and control. 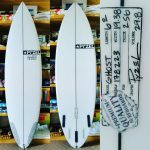 Other = A super versatile board, it has become one of JJF’s favorites for all kinds of surf (Margaret River winner, Bells Ollie Oop, J-Bay carves, and even head-high Trestles) and a go-to for many surfers around the world.Originally designed for performance in hollower, more powerful types of waves, the Ghost has proven to be great for reef breaks, dumpy beachies, and also excels in point waves.Based off of our Short Cut, The Ghost outline is more refined: it still has the wide point pushed a bit forward of center, but the nose area is kept down and the tail slightly pulled in to help it fit into a tighter curve.The thickness is also pushed forward, which helps even more with getting you into waves easily, and we kept the tail and rails thinned out to help hold through barrels and turns at speed.The rocker is med/low through the front half to get you into waves easily and pick up speed quickly. The rear end has plenty of rocker curve for turning control and a snappy responsiveness. Single concave runs through the entire bottom, with a double concave set inside, which equals speed and lift both on a rail and over flat spots while allowing for quick rail-to-rail transitions. The Ghost’s combination of rocker and concave makes for high performance handling through a healthy mix of sensitivity and control. 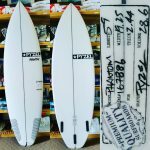 Other = Designed to be ridden fast and loose in above average to great surf, the Radius has a smooth, medium/high bottom rocker for easy turning and a single concave to add lift and drive. The gentle hip in the outline keeps it lively and sharp, while adding drive. With a flatter rocker through the entry and under the front foot to add speed, flow and drive, the tail has a touch of extra bend in the last 6 inches to make it loose and sensitive. 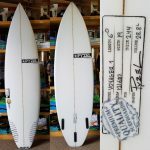 The Voyager 1 has a clean outline that compliments the rocker with a hip to help add a little squirt and creates a pivot point through snappy turns. 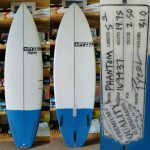 With a simple single concave through the whole bottom, the board can get on top of the water and keep speed up even in weaker surf. 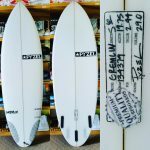 The fuller, soft rails help to balance out the effects of the concave and keep it from feeling to “catchy” and less likely to dig rail.